Eirik Evjen wears black low top Converse “Chuck Taylor” All Stars in the film. Roger, Viktor, and Arnor sitting on the porch steps. 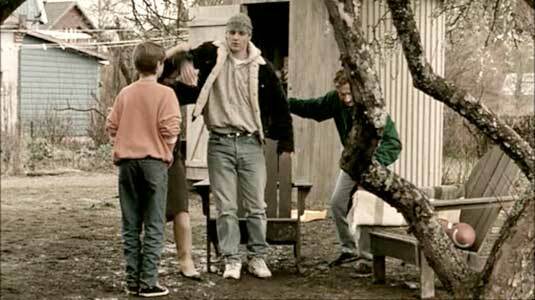 Viktor Hansen (Eirik Evjen) is a perceptive thirteen-year-old Norwegian boy living with his middle class family, which includes his father, a church sexton (Lasse Kolsrud), homemmaker mother (Janne Kokkin), and his older brother Ole Kristian (Jonas Lauritzsen), known as OK. OK is a natural athlete, and at the beginning of the film we see him playing goalie on his local soccer team coached by his Uncle Reidar (Robert Skjaerstad), who owns the local sports equipment store in town. More than anything, Viktor wants to be like OK, the cool guy that everyone admires. We also meet Viktor’s two best friends that are his age, Roger (Martin J. R. Eidissen) and Arnor (Eirik Stigar). Like Viktor, they admire OK and would like to be like him. But since they don’t have the same athletic skills as OK, they decide to form a band to get the local girls’ attention, even though none of them have any musical skills. The three boys get wrapped up in their band plans, which is exciting for them, but causes Viktor, even though he sees signs with his family that something is wrong, to ignore what is happening right in front of him. Viktor’s parents help OK up after he passed out. The big family secret is that OK has contracted leukemia. He is not responding well to treatment, and he only has months left to live. While he can, OK plans to live life to the fullest and he hooks up with Roger’s older sister, Car (Kristine Skolt Gjertsen). The only problem is that Car has just broken off a relationship with local thug Remi (Joachim Rafaelsen), who takes great delight in terrorizing the younger set of kids in town. Viktor gets caught in the middle of the triangle because he wants to protect OK. Another plot line begins to develop when Viktor and his friends go off to a week of a coed camp where they are expecting to have a good time and interact with the girls. But instead of the new camp counselor they are expecting, the pastor of the church (Bjarte Hjelmeland) is their chaperone. The three sneak out at night to visit the girls, but are caught when the ladder they use to climb up to the girls’ window falls to the ground. But Viktor makes initial contact with Sissel (Madeleine Johansen) and his brother OK cheers him up after others chide him for making a fool of himself. Viktor tries to understand what is going on in his family. OK continues to support and confide in Viktor, explaining that they were actually half brothers and their so-called uncle is actually OK’s father. Another twist in the story comes when OK reveals that Car is pregnant with his child. This is a very serious revelation that Viktor is sworn to keep secret. Viktor internalizes all of his feelings about what is going on in his life, and his just emerging relations with girls but eventually realizes that he cannot continue to live this way. Roger and Viktor pledge to do anything to help when Remi and his friend Vidar come after Car and OK and the two of them are very clever in how they prevent harm from coming to their older siblings. Sadly the leukemia causes OK to be hospitalized, and now Viktor realizes how serious things have become. Viktor has many questions that need answering, and the balance of the film’s narrative deals with how he solves problems within his family and finds the anwers he needs in his own person life. 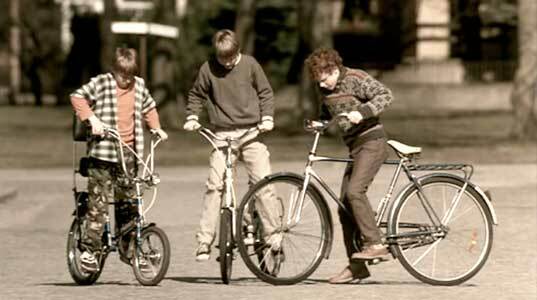 Roger, Viktor, and Arnor on their bicycles. A film like Glasskår points out the differences in concept between a typical American family film and the European approach. A film like this with serious issues, open discussion about them, and the lack of family communication when crises occur would be given at least a PG-13 rating in America, whereas the European concept is that this truly is a family film and that the audience should include the age group of the kids involved. The story is relatively simple in its events and plotline, but is well presented and the viewer quickly gains empathy for the characters, especially Eirik Evgen, who gives an outstanding performance in the lead role. This is a true coming of age story that feels completely real throughout. Writer and director Lars Berg has done a masterful job with this film. His point that young kids face these kind of issues all the time in real life rings true; so why not discuss this in a family film? Although the dialogue is all in Norwegian, it is very watchable with its English subtitles. 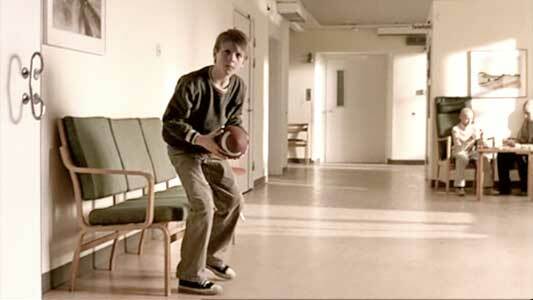 Viktor goes to pass the football to his brother OK in the hospital. Viktor picks up a shell at the beach. Glasskår is set in Norway, with its cold winter season, so when we see Eirik Evjen in his leading role as Viktor Hansen wearing black low top chucks, it is during the warmer spring and summer months. Just as you would see in America, black low top chucks are a popular sneaker for a thirteen-year-old kid like Viktor to wear, and he looks particularly good in his outfit of those chucks, a varsity jacket, jeans, and white athletic socks. 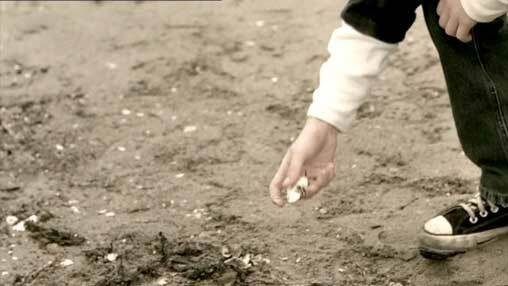 There aren’t many closeup shots, but the two that stick out are when Viktor is searching for shells at the beach, and when he sits down with his two buddies to become blood brothers toward the end of the film. Viktor sits down inside the church. Glasskår. (2012) Eirik Evjen, Jonas Lauritzsen, Martin J R Eidissen, Eirik Stigar, Kristine Skolt Gjertsen, Joachim Rafaelsen, Janne Kokkin, Lasse Kolsrud, Madeleine Johansen, Robert Skjaerstad, Iben M Akerlie, Bjarte Hjelmeland. Written and directed by Lars Berg. Categories: Coming of Age, Family. ChucksConnection Rating: MPAA Rating: NR, would be PG-13.